Chandigarh is a shopper’s paradise. It is considered to be one of the best places to shop, especially when it comes to shopping for handicrafts. One of the main reasons for this is that the city is beautifully divided into several sectors. These sectors divide Chandigarh into neat sections with a whole lot of retail stores, open markets, departmental stores as well as malls. If a fun shopping spree is what you are looking for, then this mesmerizing city must be visited. 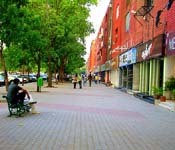 With plethora of shopping destinations, Chandigarh is a truly blessed land. The wonderful range of beautifully crafted artifacts and handicrafts makes this the most happening place for shoppers, thus attracting tourists from all over the country. This city has something to offer for all kinds of shoppers, be it a street shopper with consideration for budget or a lover of handmade goods or shoppers who look for elite brands while shopping. 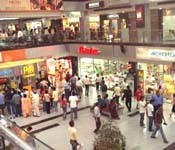 The centrally located malls attract crowds of lively people shopping with full enthusiasm. The malls of Chandigarh promise a wide range of all Indian and international brands for footwear, jewelry, accessories, clothing and crockery. This place is also ideal for all those who look for entertainment while shopping as these malls provide various entertainment options, joints for hanging out and restaurants. Shopping in the Indian city of Chandigarh is a wonderful fun filled experience owing to the numerous happening places for shopping. The elite posh crowd can be found shopping at the world class malls here. At Chandigarh, you can see a perfect blend of active cosmopolitan ambience and rich tradition. The green cover sooths your eyes. The roads are broad, clean and well maintained and a walk down the lanes can be taken to soak in the charm and natural beauty of the place. Apart from visiting the major tourist spots in Chandigarh, shopping here is an equally fun filled and memorable experience. Sector 17, 22 and sector 35 are where the major markets for shopping are located. These markets promise to give the most amazing shopping experience ever. These markets are visited by young as well as old who come here to buy and choose from a huge variety of vibrant items like Punjabi jootis, colorful dupattas, locally made woolen items, the widely known phulkaris, bright stoles and much more. Authentic hand crafted goods can be bought from several handicraft emporiums spread all over the city. The posh malls offer just the right environment and crowd for all those who want to roam and browse around with leisure. All those who are visiting Chandigarh for the first time need not worry if they are confused about what to buy and where to shop. Go through this write up to know about the best places to shop at. Although Chandigarh has a large number of handicraft emporia, there is no traditional item that belongs specifically to this place. The shopping centers in Chandigarh have a collection of handicrafts from different parts of India. The popular items that you must look for here are jootis, Parandis, durries, toys, jewelry, accessories, Phulkari work etc. the bazaars or shopping markets are luxuriant and the crowd is elite, fountains and swish arcades enhance the beauty of these markets and enrich the shopping experience. 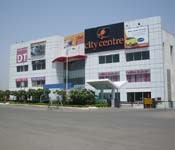 The City Center mall in sector 17 is undoubtedly the most popular shopping destination. This mall has something for all your needs under one roof. From handicraft emporiums to Punjabi dupattas to beautiful jootis and breath taking wooden artifacts, this place has it all. It is also known for mouth watering food available here. With brands like Levi’s, Dockers, Adidas, Tommy Hilfiger, Gucci, Nautica, Puma and many more, this mall is the best upscale shopping option. Another market famous among the street shoppers is sector 22. The huge area gives an open and non congested environment to shop freely. The various shops here are stacked with merchandise that you can choose from. You are sure to find anything that you can think of under the sun here. This lively market is full of hustle and bustle of excited shoppers and zealous college students who find this place perfect for their fashionable and trendy shopping needs. Fancy footwear, attractive junk jewelry, ethnic clothes, western wear and wonderful gift items, you can get it all here. The small eateries that surround the market offer sumptuous authentic north Indian food that is hard to resist. Phulkari is a widely famous type of embroidery work that has a simple look but a fine finish. Chandigarh is famous for this work. A wide variety of Phulkari work products can be seen lined up in various emporiums and showrooms in the city. Phulkari products include cushion covers, shawls, dupattas, textiles, carpets etc. You are sure to find something for yourself that you will fall in love with. If you want to buy traditional Phulkari products, you must visit the Punjab Government Emporium in Sector 17. Punjabi duppatta is a kind of long scarf worn and flaunted by the fashionable girls of Chandigarh. Heaps of brightly colored and attractive dupattas can be seen at all shops here and can be bought at reasonable prices. ‘Sparsh Collections’ is an ideal shop for buying not just these dupattas but also stoles and Punjabi suits. Jutti is the Punjabi traditional footwear. It is a wonderful gift item or souvenir that you can buy for your loved ones from this city. This footwear is a rare mix of traditional and trendy and is also very comfortable. The markets of Chandigarh offer many juttis in different styles including embroidery jutti, punch Zari khausa jutti, King wedding jutti. R.S. Apparels located in Manimajra and Pal Footwear near Janta Market is ideal stores for Punjabi footwear. The jams and juices are originally bought from Himachal Pradesh but they are famous here. Visiting Honey Hut is a must for all honey lovers. This shop has various honey products that you must buy. These include honey Tulsi, honey neem soap, honey face wash or just raw honey. Chandigarh’s woolen apparels like sweaters, pullovers and caps are very popular. Visit Smart, Jainsons Outfits, Ludhiana Garments, BlackBerrys, Black Apparels India Limited and Bansal Plaza for some of the best products and deals. Most of these are in sector 17 but you can also visit Madhya Marg in sector 9 for many other shops. Emporiums are the best places to shop for authentic handicrafts. The Dakshin Marg in Sector 20 has the Gujarat Handlooms & Handicrafts Emporium that is known for its good quality and high variety of handicrafts. You must look for the intricately carved wooden boxes, Lord Ganesha statues and Phulkari sofa covers. Note - Ritu Kumar’s designer boutique in sector 9 has the best traditional yet trendy collection of ladies Salwar Kameez. Also, sector 9 has a wonder Fab India store.